‘Save Me,’ Episode 5, recap: Will Yoongi be OK? “I thought you were gonna fall,” a frustrated Namjoon shouts at Jungkook. Namjoon has just found Jungkook on the roof of a building after setting out with Seok-ijn to search for him. It’s a moment of relief for the two, and possibly a hint of what’s to come in the near future. In previous episodes, we saw Jin save Namjoon when he ended up behind bars after an altercation with a customer at a gas station escalated. Though we don’t know exactly what happened, Jin had a nightmare before the incident but was able to prevent it from becoming a reality. Five episodes in, Jin has managed to rescue his bandmates Namjoon and Jungkook. This week, it seems, Yoongi may be in dire need of help. The defining moment of the episode comes when Jin’s phone rings and Yoongi’s name appears on the screen. The next minute, the three are at a hospital and a boy who appears to be Yoongi lies unconscious in an emergency room wearing an oxygen mask. Then Jin is alone in a bright white room, having woken up from a bad dream just as he has so many times before. This room where Jin continually wakes up may not be real in a physical sense --rather, it may represent his state of mind. In this fifth episode, the room fulfills its function particularly well as it helps the series smoothly transition from one location to another, which is both fitting and necessary for a 16-episode series. In the end, Namjoon and Jungkook are reunited with Taehyung, the real name of their bandmate V.
To this, Taehyung responded, “In my dreams.” The annoyed look on Namjoon’s face didn’t go unnoticed. Theories and analysis abounded just hours after the fifth episode was made available Thursday. 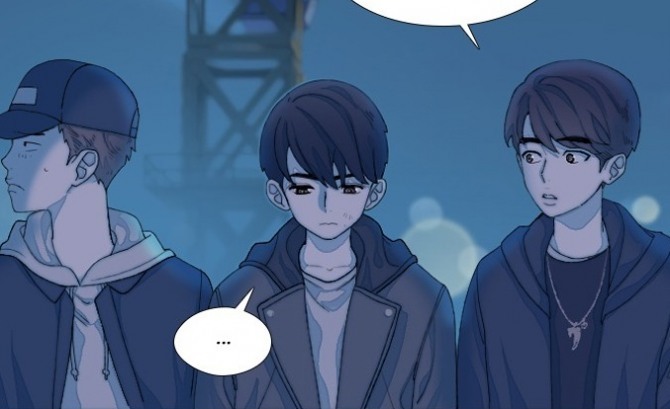 One fan on Line Webtoon said, “Poor Jungkook, he keeps on dying,” while another threatened in all caps to jump through the screen if Jungkook were killed again. One Korean fan spent Thursday morning waiting for the latest episode to go online. “The writer is playing with me. It went online at 10 a.m. on the dot. I kept reading the teaser. Raise your hands if you were waiting,” the user wrote. We are most likely to see the four who are together -- Seokjin, Namjoon, Jungkook and Taehyung -- go searching for Yoongi, whose life may be in danger. Given that Seokjin’s efforts to save Namjoon spanned three episodes, it’s likely that we won’t see Yoongi in safe hands for a while.